Edward.Hugh.Blog: Is An Emerging Market Correction Coming in Eastern Europe? To set straight an error, clarify a misunderstanding, undo resulting damage; e.g. a correction in a newspaper is the posting of a rectification of a mistake that appeared in a previous issue of the newspaper. To rectify an abnormal state of affairs - e.g. a market anomaly - as occurs, for example, in a stock market correction. A euphemism for a punishment, which may be of various kinds, mainly physical; in institutional terminology specifically used for imprisonment, e.g. correctional facility (prison) or corrections. Basically wikipedia give us a very reasonable account of the useage of the term "correction", and of its ambiguity in an economic context. "Correction" it seems means both punishment and putting right. What is so unique and so surprising about the coming correction in the East European economies is that it fits the definition of correction in neither of these senses. In the first, and most obvious case, if there is to be a punishment, then there must have been a crime, right? But where is the crime in the current case of Eastern Europe - unless it is to be some modern variant of original sin - since it seems evident that the only things that policy makers in the EU10 economies have been doing is "following orders", irrespective of whether these came from the EU Commission, the ECB, the IMF or the World Bank. They took the best expert advice available at the time, and they acted on it. Surely they can hardly be blamed - let alone punished - for that. If there have been errors, they are surely human ones, a bit too much public spending here, the odd currency peg or other there, but when we look beyond all this surface detail, and move to the underlying structural level, we find that there is a most depressing uniformity about things. I say depressing, since I do think it is hard to say the Eastern Europe has done much to bring about or deserve the tragedy which is about to unfold and come crashing down upon its head. If the twentieth century was - for no fault of their own - a bad one for many of these countries, it now seems that the twenty first one - oh horror of horrors - might turn out to be even worse. Why do I say this? Because many of these countries are quite literally dying, in the demographic sense. And since at the present moment almost all of them - with the honourable exception of Hungary - are working pretty much flat out, it might not be going to far to suggest that they are "dying on their feet" or "dead men running (on empty)" even. Which brings us back to the second meaning of correction, that of putting straight or "making whole". Unfortuantely this is just what the coming correction is not going to do. The explanation for why it will not do this will come in the following post, but suffice it to say here that - due to major underlying demographic processes and the impact of migratory flows - the traditional homeostatic mechanisms which operate during economic corrections will not be at work in this one. That is to say, what is about to happen next in Eastern Europe is about to establish, and I suspect beyond all possible doubt for the company of reasonable men, that the widely accepted neoclassical idea of general economic convergence towards a - even hypothetical - situation of "steady state growth" is quite simply a mistaken and non-valid one. Demography does matter, and fertility with a lag of twenty or so years does seem to be important. Now lets take a look at why. 1/. Labour capacity constraints (which are normally a by product of long-term low fertility and large scale recent migration flows) are producing significant wage inflation and strong overheating. 2/. A structural dependence on external financing - which is in part a by-product of the effect of low levels of internal saving, and which is another factor which separates the EU 10 from those like India or China who are benefiting from a typical demographic dividend driven catch up, is leading to large current account deficits, and potentially high levels of financial instability. 3/. A loss of control over domestic monetary policy due to eurozone convergence processes which - with or without the presence of formal pegs - make gradual downward adjustment in currency values as a alternative to strong wage deflation virtually impossible. This issue is compounded by the likely private "balance sheet consequences" of any sustained downward movement in the domestic currency given the widespread use of mortgages which are not denominated in the local currency. Now the worrying part about all three of these is that they are not simply cyclical in character. As such they are not problems which will "self correct" as a result of a recessionary slowdown, whether this be of the "soft-" or "hard-landing" variety. This problem simply is not being taken into account in many of the current pronouncements on the EU10, and certainly is in no way reflected in the current "fiscal deficit obsession" which we can find in the discourse which exists at EU Commission level (for a consideration of this in the case of the Czech Republic see this post). The macro imbalances which currently exist in many of the EU10 economies are substantial, and as I have tried to argue at some length here, they stem from a virtually unique set of circumstances (historically unique I mean, at the present time the underlying dynamic across all the East European EU member states is remarkably similar, with the possible exceptions of Hungary and Slovenia, and in each of these latter two cases for different reasons). The sad reality is that many of the EU 10 countries (and in particular we are talking here of the Baltic States, Bulgaria, Romania and Poland) are facing, at one and the same time, a very considerable inflow of external funds to fuel domestic consumption (whether this be in the form of the bank flows which drive the supply of cheap credit, or the worker remittances which drive the demand for it), and a very significant reduction in the potential labour supply following a couple of decades of below replacement fertility, and a large and sustained outflow of migrant workers which has accompanied EU accession and which is driven by the very large East-West wage differentials. Put another way, demand side factors are increasing rapidly, while supply side capacity ones not only are unable to keep pace, but are actually shrinking (if we think about the number of people of working age in the total population, and of the proportion of these who are available for work inside the country). In recent weeks a variety of players on the international economic stage have been active in pointing to the mounting problems which are now only to obvious to the trained macro economic eye. In contrast to the earlier period of weak labor demand it is now the supply side of the labor market that constrains new job creation. Many persons of working age are economically inactive in EU8+2 either because they lack skills demanded by employers, or because of labor supply disincentives, such as early retirement benefits, generous disability schemes, high payroll taxes, and limited opportunities for flexible work arrangements. These effects are concentrated among the younger and older workers, while the participation rates for middle aged workers are similar to those of the EU15. Hence the main challenge facing now EU8+2 is to mobilize labor supply to meet the demand. Really anyone seriously interested in this problem needs to read the whole report, but the above, in essence, is one part of the picture. Then, earlier last week, the IMF published the autumn edition of its World Economic Outlook, and Chapter 3 - Managing Large Capital Flows - to some extent focuses on the current problems of Eastern Europe. According to the IMF the economies of eastern Europe are vulnerable to a reversal in the surge of private capital that has poured into emerging markets in recent years. The IMF says that "large capital inflows are of particular concern to countries with substantial current account deficits, such as many in emerging Europe", as well as countries with inflexible exchange rate regimes (and among these are, of course, to be found four EU 10 members: Estonia, Latvia, Lithuania and Bulgaria). Eastern Europe is in fact the only region singled out by the IMF in this way as being particularly vulnerable to a change in the direction of private capital flows at this point in time. While the IMF draws the fairly comforting conclusion that most emerging markets now have much stronger and more defensible current account positions than they did in the late 1990s - since they have been steadily building up their foreign exchange reserves during the good times - this is not the case with most of Eastern Europe. Gross capital inflows into the region have reached levels relative to gross domestic product that are "unprecedented for emerging market countries in recent history" while "unlike in other regions…net capital inflows have been accompanied by a deteriorating external position". So, I would say, we have been warned. It couldn't get much clearer than this. Keeping nominal convergence on track is the main policy challenge in the region. The problem becomes particularly acute in countries which have given up monetary policy independence by choosing an exchange rate target or adopting a currency board arrangement. Bini Smaghi has it right, the key question for the EU 10 countries is how to maintain the levels of "catch up" growth which would enable them to close the gap in living standards which exists between East and West, and how to do it, so to say, when they don't have the raw material (in terms of labour supply) to hand to aid them in this. So, at the risk of repetition, there are three large and oustanding problems to be faced in Eastern Europe now. 3/ The currency peg issue, in the case of the four countries which are on a peg, or the rising real exchange rate one in some of the countries which aren't like Romania, Poland and Hungary. Given the dependence on foreign lending for survival, the difference at the end of the day is not significant between these countries, with the possible exception of the fact that any attempt to break the peg by one of the four countries who have one could prove to be a very dramatic event, and indeed could serve as the immediate signal for setting off the whole large scale "correction" which is so evidently in the process of coming. It's in the post, as it were. "I guess the real question to ask is: how large should the budget surplus be to counteract the inflationary effects produced by a pro-cyclical monetary policy and would this be acceptable for a catching-up country? How far reaching, and acceptable to the population, should structural reforms be? All in all, the requirements for the budgetary and structural policies associated with an exchange rate linked to the euro might just be too demanding to counteract the procyclical effects of very low real interest rates. This might lead to boom and bust cycles, with potentially very severe adjustments costs that may delay real convergence." I entirely agree, and what we are faced with here are a whole new set of problems for monetary policy, ones which were not at all anticipated when the euro was set up, or the new members accepted into the EU fold. And so to finish where we started. This correction will not correct, at least it will only correct in the punitive sense, since little that is good can come out of the affair. To understand why this is you need to look at the population pyramids of the various countries involved. 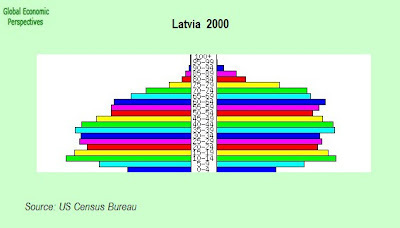 To help make this a bit plainer I have comparative pyramids for Ireland and Latvia online here. This comparison basically is to illustrate why a country like Ireland was able to get a demographic dividend which facilitated so much rapid catch-up growth, and why Latvia isn't. 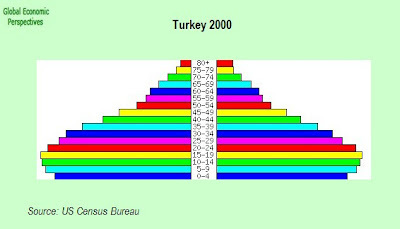 and if we now compare this with pyramid of Latvia's population in 2000, we should be able to see straight away why Turkey could correct rapidly, and why Latvia will not be able to. Essentially if we look at the size of the "10 to 14" and "15 to 19" generations in comparison with the "20 to 24" one in both cases. Think of water running down a river, and the recession/correction as a kind of dam you place across the flow. In the Turkish case closing the dam gates causes the water to back up in the system and accumulate, ready to be subsequently released as part of a flood which due to its volume maintains wages at a very low level, which is exactly what we have just seen take place in Turkey post 2000. During the years 2000 to 2002 the Turkish economy underwent a correction in the true sense of the word. There was a problem, and it was corrected. The evidence for the effectiveness of this correction can be seen in the subsequent growth rates, and even, as I explain in depth in this post, from the way in which the Turkish economy has rebounded from the currency crisis of the summer of 2006. The Turkish economy is now reasonably robust, and one of the reasons that it is so robust - given that it has made more or less similar structural reforms to all the economies of Eastern Europe - is that it has the demographic winds behind it, and not, as in the EU 10 case, blowing into its face. In the Latvian case, on the other hand, (and for Latvia here, of course, read any one of the other EU 10 countries which you please) stopping the flow temporarily doesn't correct the problem since in each time period there are progressively less people arriving to the gates of the labour market dam. It could even be that the correction here may only make matters worse, since it could in fact send many more potential workers out of the country in search of work. So far from bringing wages back into line with a competitive level, wages could in fact get "stuck" and only adjust downwards slowly, far too slowly to generate the new employment which will be needed to seriously restart the economy. This is also why all those comparisons between what is happening in the Baltics now and what happened in Scandinavia in the 1990s miss the central point, since the demographic situations of the countires involved was very different. Of course the EU10 still have the potential labour force left to get economic growth, what is in question is where they are going to get the labour supply from for the very rapid rates of catch up growth they obviosuly want and need. And all of this has been a very long and tortuous way of saying that (and to answer my own question) yes, I think a correction is coming, indeed it is already arriving, and it will be a serious one whose impact will be felt right across the eurozone. But at the end of the day it may well not do what corrections by their very nature are supposed to do, namely correct. By the very nature of the limitations of a blog post, a lot of assertions have been made above which are, to some extent, in need of substantiation. Below I list a number of previous posts where some of the issues raised are treated in more detail. Firstly, the issue of neo-classical growth, and why this is important. A good starting point on this topic would be this post here. It has been asserted that the EU 10 economies are overheating due to labour shortage problems. This is explained in the Latvian case in great depth here. Claus Vistesen does a similar job for Poland here, and for Lithuania here. I have examined Romania in depth here, and Bulgaria here. As has been argued, in fact not all the EU 10 economies are by any means identical, and the problems do vary. Despite sharing a similar demography with the rest the cases of the Czech Republic and Slovenia seem to be very different. One of the factors at work here is undoubtedly the existence of migratory flows within the EU 10 themselves, and in this sense not all will or need to follow the same trajectory (although of course at the end of the day the numbers simply don't add up, so there will be losers as well as winners). I have made some initial attempt to look at the situation of the Czech Republic here. Hungary is again a very special case, and is certainly not overheating at the present time. I have a whole blog dedicated to trying to understand what is happening in Hungary and why it is so different, this post and this one might be a good place to start. One common assumption is that labour shortages in the EU 10 can be met over the longer term by inward migration from other parts of the old Eastern Bloc like the current CIS countries. Immigration may well be part of the answer for the EU 10, but the CIS itself is unlikely to be a durable source of supply here, basically because a large part of the CIS has a similar demographic profile. This post goes into the Ukraine situation in some depth, and here is a link to some work by Russian economists who advise the World Bank, and who argue that Russia may well be already in need of around a million migrants a year if she herself is to be able to maintain current growth rates. I even went so far as to check out Uzbekistan, since many seem to think that these Asian members of the CIS might be better placed, but unfortunately my conclusion was that with all the demands which are being placed on them, and all the money which is heading back home in remittances to fuel growth it won't be long before they run out too. Finally, if you have gotten this far, all I can say is thanks for your time, and good luck and good reading. Is the low level of saving in the formerly Communist countries a function of the dependence on state-sponsored pensions, such as they were? Put a different way, are residents of these countries not in the habit of saving the same way as German and Japanese residents because of a residual mindset due to the Communist influence?